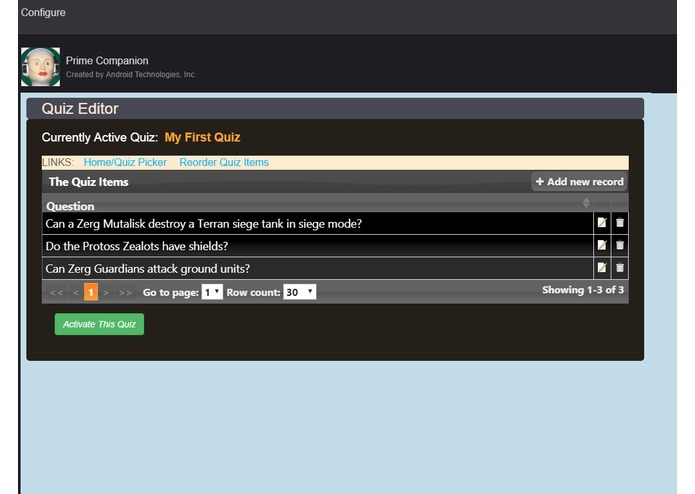 Prime Companion for Twitch is a quiz builder and taker that Twitch broadcasters can use to easily create quizzes for the viewers. Quizzes can be created offline so they are ready during a live broadcast. During the broadcast the broadcaster has complete control of when to start and stop the quiz. Prime Companion completely handles the user interaction to facilitate the quiz. When the quiz is ended by the broadcaster, the results are displayed to everyone in chat and in the broadcaster live page. The app was built using the Alexa Skills SDK, AWS Lambda, and DynamoDB handles the database operations. UPDATE: I didn't quite understand that you had to actually turn over your source code for the front-end. Unfortunately I figured that out at the last minute. There is no time to separate out the front-end from the back-end code since currently it's one unified project. If you're interested in this extension, please watch this page. Once I get time to split out the front-end code from the Extension back end code, I will update this page and let you know. Thanks for the opportunity to enter the contest. Even though I can't participate any longer, due to the reasons explained above, I had a great time working with the Twitch API and still intend to get Prime Companion into the Twitch extension family, once I have the time to do so. Natural language processing & understanding developer with strong speech recognition skills and also smart contract development experience.